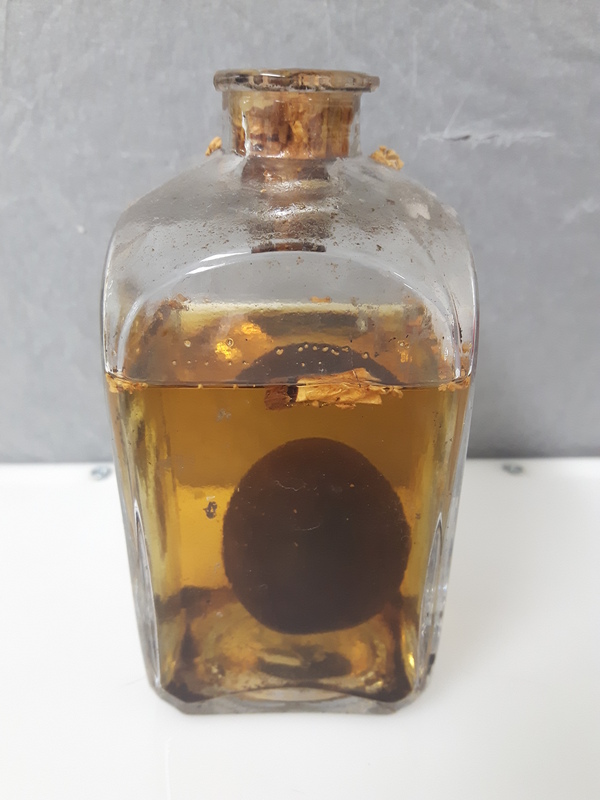 When Museums Get it Wrong – Did We Accidentally Accession Someone’s Holiday Booze? I have a strong suspicion that an object that is now in our collection at the Grant Museum was in fact a souvenir bottle of plum brandy. How could such a thing happen? The mystery specimen in its original fluid before conservation. Is it in fact a bottle of plum brandy that a researcher bought as a souvenir? (C) UCL Grant Museum of Zoology. 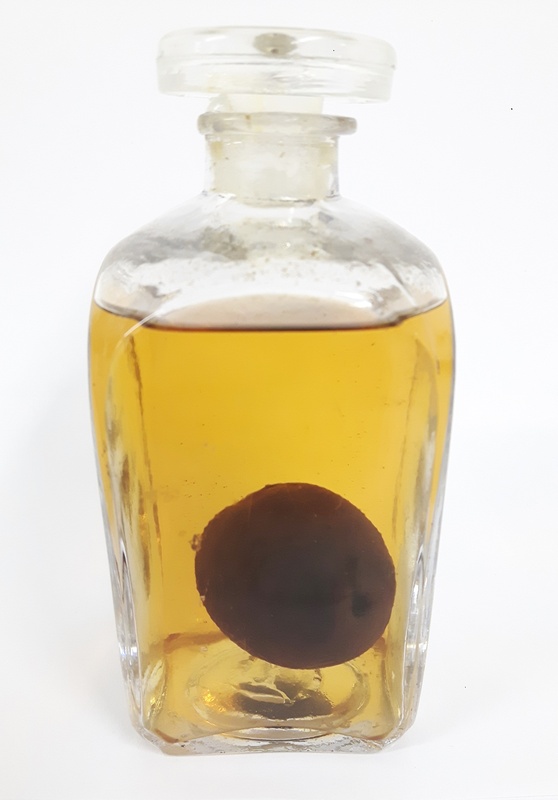 My former colleagues Mark Carnall and Emma-Louise Nicholls first brought this “specimen” to my attention in 2011, when they found it in our wet specimen store: an unmarked bottle of clear brown liquid containing a near-spherical object with a cork stopper in its narrow neck. Mark wrote a blog at the time working through the process of elimination of all the spherical objects that might belong in a zoological collection such as ours. While others had assumed it was a testis, Mark and Emma decided that it was in fact a plum – not zoological at all. Aside from its identity, the other question was: how did a 25mm sphere get in a bottle with a 10mm neck? We all thought this was one of those amusing conundrums that we find all over natural history museum collections (along with, for example, why did our fluid-preserved opossum have a D-Cell Duracell battery in it?). The answer is surely that the jar was placed over the fruiting bud as it grew on the branch. And so it was placed back on the shelf and forgotten about – undocumented – until 2016, during our “Project Pickle” conservation work, dealing with the needier specimens in the storeroom. Freelance Conservator Lucie Mascord and our own Emilia Kingham came across the specimen again. To their eyes, it was dehydrating, in a cracked jar, with an inappropriate stopper: a prime candidate for conservation. It was only in talking about it then that I began to suspect that it might not be a museum specimen at all. To me, it seemed far more likely to be booze. To understand how such an error can occur requires some understanding of the “organic” way in which many university collections historically came together. Rather than strategic, policy-led acquisition pathways of objects with detailed life histories, university collections often contain poorly provenanced assemblages of various researchers’ material. As researchers handed their material over for storage/died/retired, it was simply absorbed by the collection (without documentation officially transferring the collection from the researcher to the museum), and often left to be properly assimilated and documented “later”. As such, we operate under the assumption that all of the specimens physically now in the collection belong to the collection, unless proven otherwise. In tackling our documentation backlog today, we treat all specimens equally – if it is in the storeroom, it forms part of what other museums might call their “accessioned” or “permanent collection”, even if we are yet to actually give it an accession number. Returning to our plum, what I imagine happened is that one day the museum got a call from someone in the university’s zoology department that an academic had left/retired/died and there was a load of what looked like “museum material” in their office: could they come and collect it. Picture the scene: the office contained specimens in various locations, in crates on the desk and on bookshelves. Alongside – and potentially indistinguishable from – more legitimate research material was this little bottle. Little did they know – I suggest – that it was in fact a bottle of plum brandy: a souvenir from Eastern Europe or Korea or any number of places who make products like this. And so it was plonked on a storeroom shelf with the other miscellaneous fluid specimens, waiting for that magical time all museum workers rely upon: “later”. Later has now come, and the Project Pickle team went about conserving it along with all the other specimens. Like Mark and Emma before them, Lucie and Emilia were intrigued by this mystery unmarked bottle. The fluid was discoloured and evaporating, so they replaced it. Needless to say they didn’t taste it. They were unable to identify the fluid it was in, but did describe the smell as “sweet”. We’ll now never know if was in fact liquor. The “plum” after conservation, (the fluid has since become discoloured again). (C) UCL Grant Museum of Zoology. What’s interesting is that now it actually has become a museum specimen by default, stored in 80% alcohol. While its lack of provenance may mean it is of little use as a scientific specimen, I like to think it tells a neat story about the way museum collections have come together. Written by Jack Ashby, Manager of the Grant Museum of Zoology and author of Animal Kingdom: A Natural History in 100 Objects. I am sure we have some elderly sloes in gin and possibly also a bottle with aromatic herbs in alcohol, from a failed attempt to recreate an Ibiza herby liqueur. Both look like “specimen” collections rather than consumables!